Certified Independent Business Advisor. The AzMA helps educate small business owners to master direct response marketing and facilitates high energy, high impact Mastermind groups. WHY CHUCK QUALIFIES TO BE ONE OF THE 2017 FEARLESS THIRTEEN. The main reason that I was drawn to Chuck when I met him, is that he is a get-it-done kind of guy; a characteristic I can recognize from the first moment I meet someone. It is evident in their eyes that they are on fire for what they are doing and are not dragging their feet about getting “it” done. Get-it-done people are a rare commodity and I make it a point to get to know them better when I meet them! About a year ago the President of the Arizona Marketing Association, Blaine Oelkers, reached out to me on LinkedIn. He invited me to a meeting and asked me if I might be interested in becoming part of the Mastermind group. The fact that he was leading Mastermind groups immediately intrigued me because I am a big fan of Napoleon Hill. I have read his book, “Think and Grow Rich” every year for more than fifteen years, and every time I read it, I learn something new. It took a while before I finally was able to attend a meeting this year. In a weird twist of fate, I also got the chance to hear Blaine deliver a TedX talk in Fountain Hills the week before my visit. I was impressed with his delivery and his passion for his topic: WYTAYBA – The Connection in Your Mind . At my first AzMA meeting, when Chuck and I shook hands, we realized that we had already met years ago at a Networking Phoenix event. In another weird twist of fate, the Founder and Owner of Networking Phoenix is also participating in this year’s AoFDB series. This is how networking works. We just keep bouncing off one another until we have a really good excuse to collaborate on something together. other entrepreneurs on a regular basis. I believe that Chuck and Blaine are doing great things with the Arizona Marketing Association because they are helping to empower business owners to be successful by being a positive influence and an excellent example of how to get things done. Chuck has had a long history of running successful businesses and his desire to help other business owners do the same. He was ranked 31st out of the top 200 business coaches in America by Six Figure Coach magazine. He is one of those serial entrepreneurs that simply cannot retire because he is not merely working for a paycheck; he is working to leave a legacy of success. I also want to take this opportunity to once again thank Chuck for his service to our country as a U.S. Marine Sergeant in Vietnam. His commitment to Napoleon Hill’s idea that having a Mastermind group makes you a hundred times more powerful! He has an old school / get-it-done no matter how apprehensive you are attitude. He is a collaborator who attracts the right people by speaking his mind straight from the hip. Chuck took a few minutes out to answer the five Art of Fearlessly Doing Business Questions. WHAT CAN WE LEARN FROM CHUCK ABOUT BEING FEARLESS? Opportunity does not just land in your lap, at least for most people. For most of us, opportunity is an evolution. When I think of all the things that had to happen for me to invent the AoFDB project it makes me laugh because my business concept and this very project is a by-product of all my life and business experience. The Arizona Marketing Association has also evolved from a lifetime of experience, learning and collaboration. It was not created based on a whim; it evolved to become what it is today – a prospering organization with more than 150 members. In order for us to be successful; we have to know what makes our business and us unique. AzMA’s USP is that it helps educate small business owners to master direct response marketing and facilitates high-energy, high impact Mastermind groups. Chuck knows that as business people, we have to deeply understand what our end goal is in order to get our clients to take a specific action and buy what we are selling. I have always believed in the concept of the mastermind. I believe great things truly happen when minds unite and collaborate. I think that is the reason I collaborate so often on the work that I do and on this very project. I also believe there is power in numbers. Many minds together can look at a problem from many perspectives and come up with a much better solution together than one could alone. As a solopreneur, I actively seek out inquiring and powerful minds in order to be inspired and pushed. Our minds left to their own devices are sometimes not our friend. Having the input, encouragement and council of other intelligent, driven people, is not only smart; it is required, in my opinion, to achieve any level of success regardless of industry. When I find like-minded people, I am very loyal to them and I hang on to them for a lifetime. To me they are priceless. Have you ever felt a magnet repel another magnet? Try as you may, there is no joining magnets that are repelling one another. I began thinking about that concept of repelling versus attracting, and it is an interesting one. Every magnet has both a North and a South Pole. of another magnet, they are attracted to one another. (North to North or South to South), they will repel each other. So in a real way, opposites attract with the science of magnetism. However, in business, the concept is reversed. We WANT to attract like-minded clients and associates and repel those that are not on the same wavelength with us. Chuck and I both know that it is a waste of time and resources to nurture relationships with people who are a bad fit for your business or other needs because they are emotionally exhausting. The bottom line is that we don’t want to attract all the people; we want to attract just the right people. Chuck has a perspective on life that most of us hope never to have, yet he has used his military experience to benefit his life. As a U.S. Marine Sergeant during the Vietnam War, he has lived through what most of us can not even imagine. When he talks about the fear of speaking he says, “Hell, they used to shoot at me.” Public speaking? No big deal. Chuck simply won’t entertain fear at all because from his real life experience, he knows that fear will first paralyze you and then it will kill you. Chuck learned from his military service to not call FEAR by its name. Similar to the Harry Potter characters who say, “He Who Cannot Be Named” instead of the Lord Voldemire’s name; Chuck replaces the word fear with apprehension. For him, apprehension is a motivator that sharpens you, making you hyper aware and more effective. Chuck’s viewpoint on fear is a reminder that even though many of us take on very real risk, it is crucial to keep what is most important in perspective. Life itself is the prize. The successes we are lucky to enjoy, when we are presented with them, are not the cake of life – they are the icing while the occasional failure along the way is the price of admission, not the end of the world. Thank you so much Chuck for taking the time out to be one of the Fearless 13! I look forward to seeing you again at the Art of Fearlessly Doing Business Art opening on May 5th at DeskHub – Scottsdale from 6-9PM. 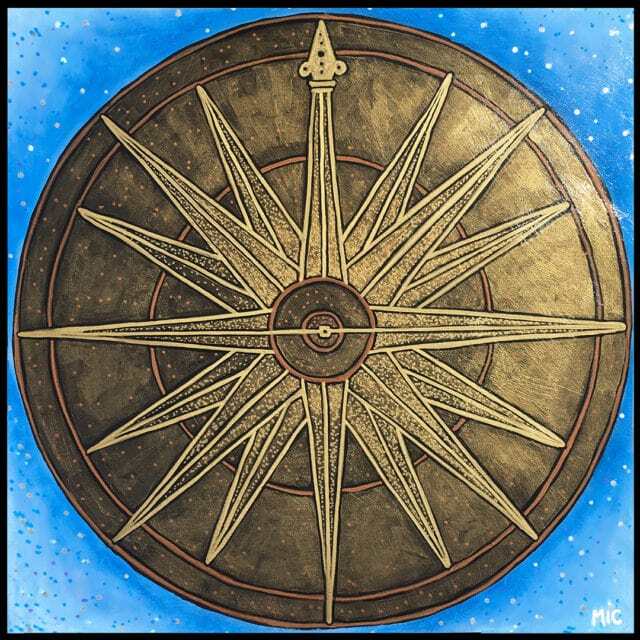 How I arrived at the magnetic compass, as a symbol is another perfect example of how the mastermind model works. I have to share that this week has been a stressful one for me as a result I have been feeling substantially drained. It is hard to come up with the next idea when I am in that drained state. When I am drained with a deadline and stuck, I pick up the phone and I start to call the members of my Mastermind group. My best friend Peggy, who is also my editor, is always first on my list. Peggy has been my best friend for thirty-two years. She knows my heart and I know hers. We are one another’s biggest fans and when life gets nutty, we have one another’s back. She is one of my biggest assets and I am beyond blessed to love and be loved by her. As I paced around my backyard with Peggy on the phone, like I have so many times before, she sat in her living room in Saratoga Springs, N.Y. watching yet more snow falling. (Enough already mother nature!) She listened to where my brainstorm had gotten me so far with Chuck’s image. I had spent a day with the panel ready to be painted and still had no clue of what to put on it. I knew the idea for this illustration came from magnets and the concept of repelling versus attracting. I was learning a lot about magnets but realized that magnets were not the full solution, only part of the solution. I mentioned to Peggy that it’s interesting that every magnet has a North and South Pole. If you put the like poles together (N+N or S+S) they repel one another. If you put opposite poles together (N+S) they attract. I continued in stating that I imagine that is where the phrase “opposites attract” comes from. However, in Chuck’s opinion we are looking for the right people or like-minded people. Ultimately, as entrepreneurs, we are not looking for love; we are looking for business. Peggy made the suggestion of leveraging the idea and concept of having a “true north.” I liked what she had to say right away because Peggy and I often tell one another we are each other’s true north. When either of us starts to forget what we are really all about, the other redirects us back to our “True North” – our truest self. Then Peggy reminded me that a compass is magnetic. I don’t think I ever really thought about it but of course a compass is magnetic. When she said that I laughed and those of you who have been following this series know that when I laugh, I know I have the idea. Then I started to research compasses and got excited. As it turns out, there are a few norths: The North Magnetic Pole, the Geogrphic North Pole and the North Geomagnetic Pole. What’s even more interesting is that these norths actually change over time, and depending on where you are on the globe. The resulting fact is that compasses have magnetic declination or variation. Isn’t this just like life. We get ourselves locked into a direction and then something changes that requires us to shift our direction sometimes mildly and at other times more dramatically. Our clients are changing, we are changing, the world is changing, which means that in order for us to get our clients and associates to take the action we want them to take, we have to be paying attention. Chuck states that we have to know who we are and where we are going in order to stand behind our business. In other words, we have to have a true north in order to succeed. However, our north is not static, it is ever moving which demands that we stay on our toes, and never stop monitoring our progress and educating ourselves. In order to find the right clients and associates, we have to tenaciously stay on our own path. A compass is the perfect symbol for Chuck because it is the device that helps us stay moving in the right direction by using the science of magnetism where we repel the wrong people and attract the right ones!